With all those steep inclines in San Francisco, it makes perfect sense for the city’s bike-sharing schemes to include electric motors with their two-wheelers. Jump launched a service using electric-powered bikes in the city last year, with Uber incorporating the scheme into its app in January as part of a trial. And now, Ford GoBikes, already a well-established bike-sharing scheme in San Francisco, is adding 250 ebikes to its fleet, easing the burden on tired legs battling to climb some of those challenging hills. Dubbed the “Ford GoBike Plus,” the new ebike can reach speeds of 18 mph, enabling you to “chop your commute in half and experience the city from new heights,” says Motivate, the bike-sharing company behind Ford GoBikes. To find a Ford GoBike Plus, riders simply fire up the app and check the online map for a lightning bolt icon indicating a docked ebike at one of its 287 stations. The bikes can be rented using a Clipper card or a smartphone with the app, and parked at any of the Ford GoBike stations throughout the city. As it’s an ebike, you’re advised to check that the bike’s battery meter shows at least two bars before you confirm the rental. To celebrate the arrival of the ebikes, Ford GoBike is reducing the price of its 30-minute single rides from $3 to $2 as part of a limited-time promotion. Meanwhile, unlimited ebike rides can be enjoyed with a Ford GoBike membership, which costs $149 a year. Existing Ford GoBike members can hop on an ebike at no extra cost. For visitors to the city, a pass offering access across any 24-hour period can be bought for $10 and includes unlimited 30-minute rides. Ford GoBike launched in June 2017 and currently has 287 stations and more than 3,600 bikes across the Bay Area. 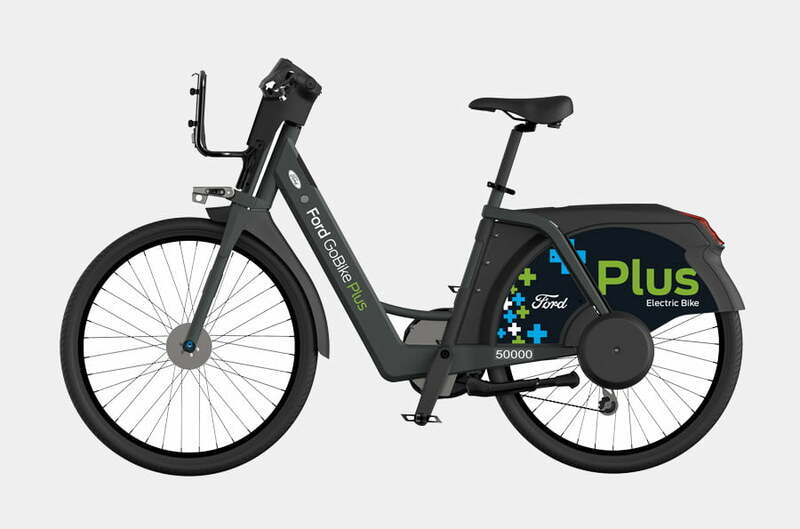 The next step is to grow the fleet to 7,000 regular bikes and almost double the number of stations, an expansion that will make it one of the biggest bike-sharing schemes in the U.S.
That is, of course, if everything runs according to plan. Competition in the bike-sharing space is becoming intense in the U.S., with a plethora of firms continuing to enter the market. Inevitably, some are falling by the wayside. Chinese firm Bluegogo, for example, pulled its bikes from the streets of San Francisco in March 2017 after just a few of months following a battle with the authorities over permits. It’s since gone out of business. And, again in San Francisco, there have been reports of a backlash against such services — Ford GoBike among them — with some locals viewing them as representative of the big tech companies in the area, which they claim are ruining neighborhoods by causing a housing crisis and increasing income inequality.